These decks of spell cards are an invaluable resource for any magic-user. Consult the entire deck when selecting new spells to learn, and after a long rest you can set aside those spells you want to prepare for the day. Each deck is made from thick laminated card so they will stand the test of time. - Spell name and important info is easy to find for quick reference. - Descriptive/Mechanical text is written in full wherever possible. When it isn't, a Player's Handbook page reference is given. - Scaling spells have an additional section with details on how they improve. - Card backs prominently display spell level for easy sorting. - The Spell cards are highly durable and are made to last. Each card has a coating that protects them and makes them safe to use with dry erase markers. These decks of spell cards are an invaluable resource for any magic-user. Consult the entire deck ..
&D ELEMENTAL EVIL PRINCES OF THE APOCALYPSE Abolish an ancient evil threatening deva.. Unravel the mysteries of Ravenloft® in this dread adventure for the world's greatest roleplaying g.. 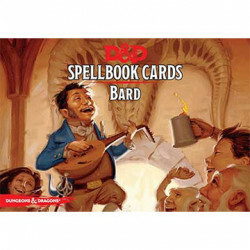 Contains 95 durable, laminated cards that expand the options available for spellcasters of all age..